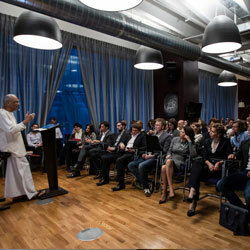 The corporate world is afflicted with worry, anxiety and stress. This affects the quality of your work and productivity. Work degenerates into monotony, boredom and even causes physical ailments. People look forward to getting away from work and court weekends and vacations for their enjoyment. If you cannot find happiness in your work, you will never find it. The source of the problem is lack of Self-management. 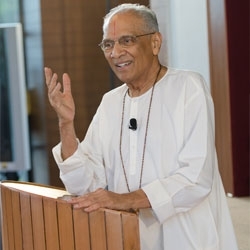 If you cannot manage yourself, you cannot manage your family, your business and the society around you. 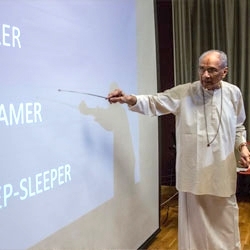 Swami Parthasarathy has pioneered Self-management corporate programs to teach the fundamental techniques underlying productivity, time-management, stress reduction, leadership and streamlining relationships. Self-management is the key to gaining that elusive combination you want-efficiency at work and mental equanimity within. 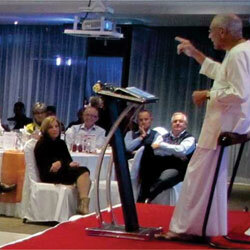 Also a resource for strategic planning sessions and company retreats. 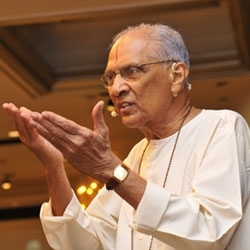 Over the last 50 years, Swami Parthasarathy has been addressing organisations and corporations in USA, UK, Europe, Russia, China, Malaysia, Singapore, Australia, UAE, South Africa and India.